Unfortunately this chess genius became mentally sick later on and for this reason is called "The Pride and Sorrow of Chess"
Paul Morphy grew up in a wealthy family. His father, Alonzo Michael Morphy was a lawyer and his mother, Louise Thérèse Félicité Thelcide Le Carpentier, was musically-talented so Morphy grew up in a cultural atmosphere where chess and music were typical highlights of social gatherings. 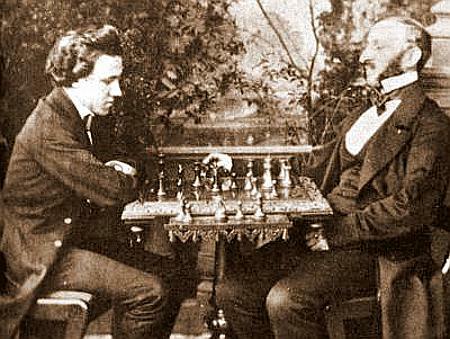 Morphy was a chess genius because he reached a remarkable playing strength at the age of twelve and could play a game blindfold, that means without looking at the board. He learned the chess rules from his father and his uncle, just by watching their games. One day General Winfield Scott, who played chess occasionally, came for a visit and wished to play with a strong local player. After dinner young Morphy (9 years old) played him and has beaten him twice. General Scott never played Morphy again. 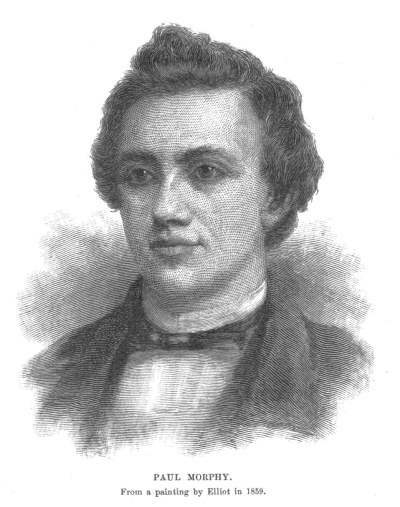 In the year 1855 he began to study law in Louisiana and received his degree on April 1857, but was not allowed to work in his field as he had not reached the legal age to practice law. For that reason he had plenty of time to play chess and has beaten the american masters at the time. In 1857 he won the chess tournament of New York. A year later he toured Europe to beat the german master Adolf Anderssen and all players who challenged him in London and Paris. Only the english master Howard Staunton (inofficial worldchampion) refused to play him after he has watched him beating the best players around. Frederick Milnes Edge, a journalist of the New York Herald accompanied Paul Morphy as his privat secretary who published later on a book about Morphy. After Morphy returned to America he could not practice as a lawyer later on as the general public knew him only as a chess genius and was unable to perceive him as a lawyer. 1867 Morphy bitterly retreated from chess completely. Some time later on Wilhelm Steinitz became world champion and he wanted to visit Morphy who met him under the condition that they will not talk about chess. Morphy became mentally sick and died lonely in Juli 1884 aged 47 in his hometown. His style of play consisted of fast piece development, building up pressure consistently and retaining the initiative of the game.